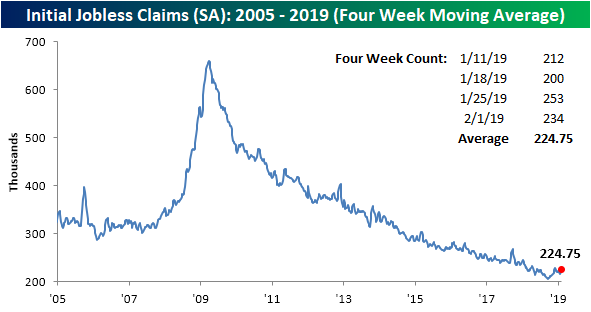 After spiking all the way up to 253K last week, breaking a 68-week long streak of readings below 250K and reaching its highest level since September 2017, Initial Jobless Claims fell a bit this week but still remain fairly elevated. Claims came in at 234K versus forecasts of 221K. Just to illustrate how strong claims have been relative to expectations for the last few years, the last two prints represent the first back to back weeks where claims were more than 10K higher than expected since March 2017. 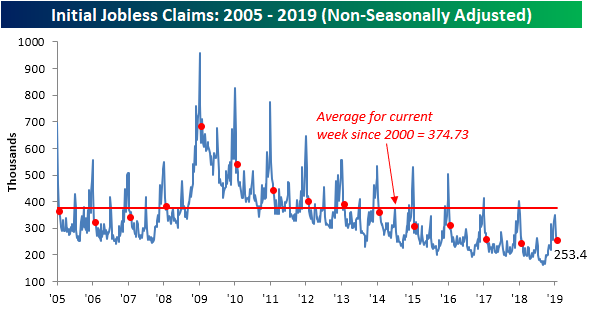 Though claims are elevated, they are still low from a historical perspective and don’t forget, just a couple weeks ago claims came in at one of its strongest levels since the late 60s. Unless it turns into a sustained trend, the increase of the last two weeks is not a major concern. In terms of the four-week moving average, this week saw another lower reading roll off only to be replaced with a higher one, as such, the indicator ticked up to 224.75K versus 220.25K last week. 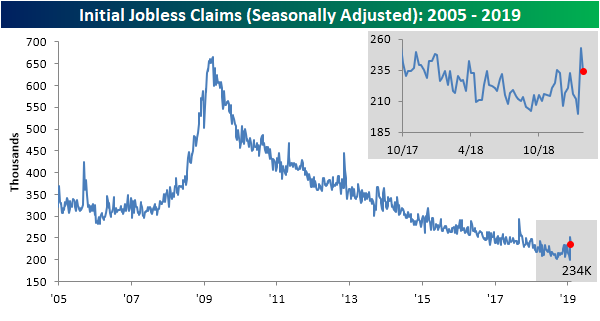 This less volatile measure of jobless claims has now risen for three straight weeks. It has also now spent some time off of its lows from early September. In fact, it has now been 21 weeks since the four-week moving average made a new cycle low, which is the longest streak since April 2016 when we went 26 straight weeks without a new low. Looking to the next couple weeks, the moving average will likely continue to increase as the lower 212K and 200K prints from early January roll off of the average. The non-seasonally adjusted number also picked up this week to 253.4K from 250.2K last week. Granted, for the current week of the year that is a normal effect to see a slight uptick from the prior week as the average also ticked up to 374.73K versus 369.39K for last week. This week’s NSA reading is still well below this average of 374.7K since 2000, but it is about 10K above the data point for last year.